The asters are in full bloom today, September 29th, the feast day of St. Michael the Archangel, which is observed by some Christian traditions. In my garden, it is observed by remembering to call the asters by one of their common names, Michaelmas Daisies, because they are generally at or near peak bloom on this feast day. This year, they are right on schedule and I'm thrilled, given how ratty and dry they looked through most of the summer. I was so thrilled with them that I went outside and took pictures of them. Again. As I do every year. This particular variety is a passalong from my aunt, so I just call it 'Aunt Marjorie' if anyone asks what variety it is. I have loads of them, mostly in Plopper's Field. I have so many that I may move some of them to August Dreams Garden border across the way. One of the pictures I took of these asters/Michaelmas Daisies has prompted me to develop a quiz, in consultation with Dr. Hortfreud, based just on a picture of asters. I call it the Aster Personality Quiz. Dr. Hortfreud insists on having her name on it. Please look at this picture and quickly decide what you see. Don't dwell on it or look for something that you don't see. Just see it and decide what it is that you see. As with all these quizzes here at May Dreams Gardens, there is no right or wrong answer, no score, no scientific basis for the results, just a peak into your personality, according to no one else but me and Dr. Hortfreud. If you saw a bunch of purple flowers and thought "Oh, how pretty" then you are the type of person who sees the big picture in life and doesn't dwell on details. You might also be someone who likes the color purple. If you saw the bee in the center of the picture, you are someone who sees the details right away. People may have told you before that you can't see the forest for the trees, or however that saying goes. If you saw the white daisy in the upper left hand corner and then saw all the asters, you are someone who tends to gravitate toward that which stands out rather than going with the rest of the crowd. If you saw the asters and thought, "Are they still calling those "asters"? I thought they changed the genus name to Symphyotricum. I wonder which species these are? S. nova-angliae or S. novi-belgii? Oh, I think they are S. nova-angliae. And how many species names have hyphens like that? They are pretty, but what is the variety? And why is there a daisy in the picture? Daisies don't bloom in the fall, they are a summer flower. Is it a Leucantheum? Yes, I think it is. Is it lost? Etc." Well, if you thought all that in the few seconds of seeing this picture, you are someone who should go outside and enjoy the beauty of Fall. It will quiet your mind and maybe help you stop thinking for just a minute. Really, it would be good for you. How did you do? And did one of these descriptions identify you? If I had had my glasses on when looking at the picture, I might have seen the bee. But when I looked at it, all I thought was purple. 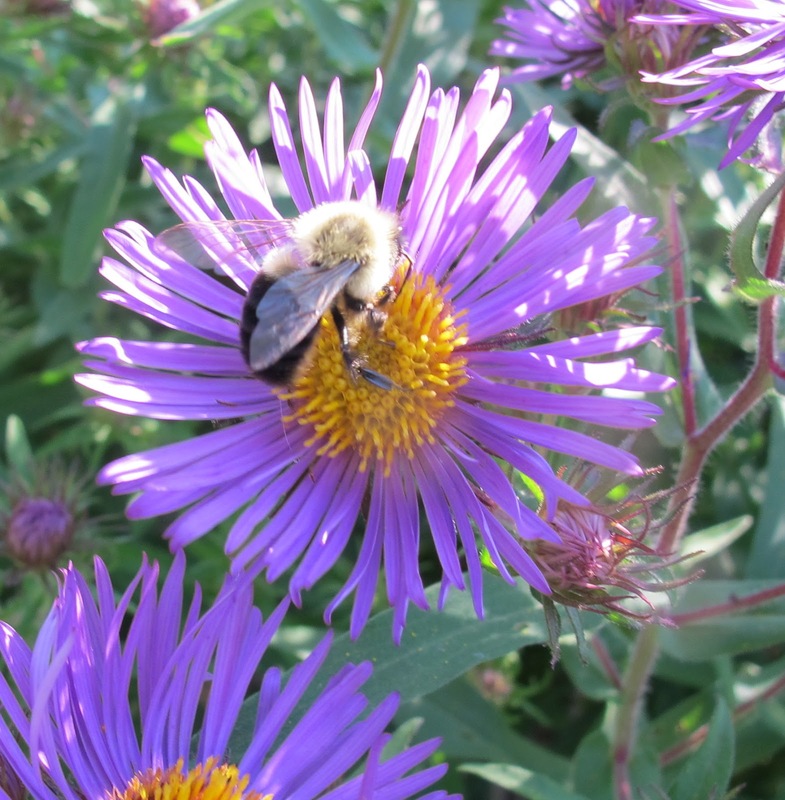 I saw a river of purple with a bee right in the middle of it. I didn't even see the daisy until it was brought to my attention. i saw the bee imediately, maybe it's because i'm recently obsessed with bees and attracting them to the garden so i can take photos of them, or maybe i just can't see the forest for the trees. Thanks for the quiz, Carol. At first I thought I was in the "happy" category, but when you offered the bee option, I fell into that category because I saw the bee right away. I would have fallen into the final category had I not read your blog that told me you really didn't know the variety. I enjoyed the brain exercise! I thought "Ooh, asters with a bee in them!" I really enjoy watching the bees in my asters- they just love them. Sometimes the tall purple one is just a big, humming mass. I'd go with the last answer, and going outside wouldn't help! I saw the light in the right lower corner. Or maybe it's my computer. I think it means I'm worried it is getting dark cause winter is coming. Thanks for reminding me what Michaelmas daisies are. I have a friend from the UK who commented on them in a post, and I was trying to remember what they were. Image and information about Aster both are stunning and appreciating. Aster is just eye-catching.